As Christmas draws near there’s more than gift lists to prepare. We need to prepare our hearts. 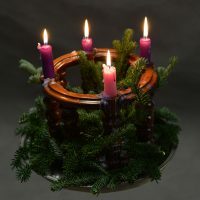 One way is with an advent wreath. Advent begins December 3rd, so prepare ahead by making plans to focus on Jesus during December. It can be fun to light an advent wreath each day. Each candle has a name and meaning that inspire us to act on the word. Hold hands to form a human wreath and say a prayer for the person on the right, going around the circle. Then compliment the person on the left. Because Christmas is so much closer and the wreath is so lit up! Joy is not the same as feeling happy. Joy is an inner gladness of heart that comes from trusting God. Talk about the acronym j-o-y for Jesus-others-self. If we put Jesus first and think of others before ourselves, it is much easier to have joy. Rejoice with the candy cane shape of a shepherd’s staff. Make rolls, cookies, and cake in the shape of a candy cane this week. Talk about the message the angels proclaimed at the birth of Christ. Before speaking, consider if the words will be kind. Peace doesn’t mean avoiding problems, but reminds us to discuss differences, listen calmly and find a solution that benefits people without hurting anyone. Pray for world peace and peace with the people you see daily. Help your family celebrate and give thanks. Set the table, make decorations, and write a poem or prayer to say. Use the WORD list to pray and thank God. Find the words in the puzzle. What kind of person does God want us to be when we give thanks or give things? Find out by filling in the letters with the unused letters of the word search. Check it in 1 Corinthians 9:7. By: Karen Whiting (www.karenwhiting.com) an author, speaker, and former television host, has a book all about advent called Christmas is Coming! But Waiting is Hard: Family Activities and Devotions for Advent.